A spur of the moment decision last night saw me heading this morning to the UK Detecting Rallies open rally at Carlton, near Olney, in Northants. The site was billed as around 120 acres of ploughed, rolled and seeded arable land. ARCHI showed the area to be rich, especially in Roman material. The weather was reasonable (cloudy, around 16C and dry except for light rain mid morning). It all looked very promising, even for an open rally. 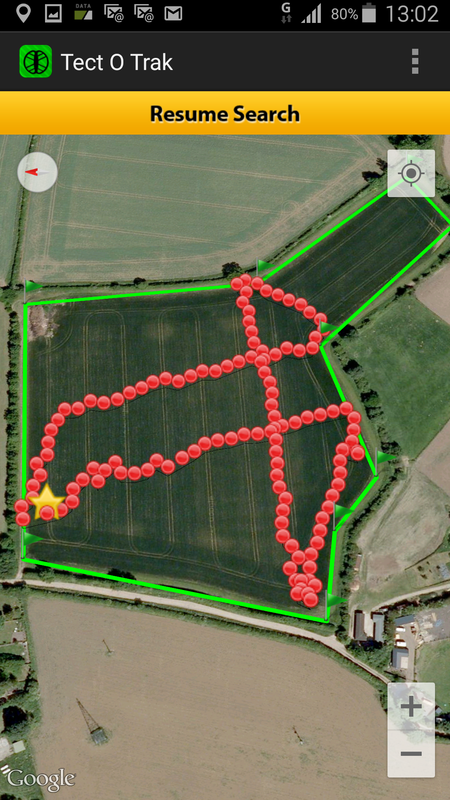 My plan was to concentrate on one field in the morning and another in the afternoon. The morning’s field had reportedly produced a William I penny the last time the site had been detected, though apparently on that occasion most diggers spent the day on another field which had produced a couple of Anglo-Saxon pennies and a few later medieval hammies. Unfortunately it was a dead loss. By the time I left at around 1.30pm, after 3 hours detecting and an hour for lunch and talking to other diggers, the sole reported decent find was of a hammy of some sort from one field. I didn’t bother with any of the other fields as I left straight after lunch, but it’s obviously possible that other decent finds were unearthed in the afternoon. My impression, and that of others I spoke to, was that the fields had been more or less detected to death; if they hadn’t, why was nobody finding anything today, notwithstanding any finds on earlier visits? It was an expensive half day out, factoring in the cost of a 160 mile round trip and £15 for the dig fee. The lack of finds was obviously disappointing, but at least I met and chatted to other detectorists. It was, nevertheless, a joy to detect with a pin-pointer that sounds off only when it should do. Although I thought I’d fixed my Garrett pro-pointer a while ago, it has never in practice really behaved properly since then. Gradually the falsing problem reasserted itself and it was obvious it had to go. So off I went to Regton this morning to buy a new one. The shop was quiet and there was plenty of time for a good yammer with Nigel, during the course of which we discussed everything from the local clubs to the new Minelab plastic detectors. Nigel showed the latter to me. Apparently they perform pretty well and may have the edge over Garrett’s Ace machines from a performance point of view, but ye Gods they are flimsy! I can’t see them lasting very long in the field. Indeed, they look like something you would give the kiddies to play with on the beach and I’d be surprised if any serious beginner would choose them over the Ace series. I was also pleased to see that Nigel is now stocking a range of those pocket-sized compartmentalised plastic boxes which are ideal for keeping small, high value finds safe. When I first saw them being used I spent hours trying to track them down before discovering that they were commonly used by anglers and therefore readily available in fishing tackle shops. I’ve had a few more off fleabay since then. You can never have too many of them. Anyway, I treated myself to the new Garrett Pro-Pointer AT and threw in a couple of magazines and a book on lead tokens and tallies for good measure.